Power Hardware-in-the-Loop (PHIL) simulation represents a natural extension of HIL, in which the real-time simulation environment is capable of exchanging not just low-voltage, low-current signals, but the power required by the Devices under Test (DUT). To bridge this gap, power amplifiers are inserted between DUTs rated for higher power and the low-level simulator I/Os, all while providing the necessary feedback to properly close the loop. Power amplifiers are selected for user applications based on their closed-loop performance and ability to generate and absorb power. While HIL and closed-loop testing provide many benefits, PHIL also allows the simulation of higher power flows between DUTs, as well as with the simulated electric circuit running on the simulator. This capability enables engineers to test multiple systems, including power converters, generators, motor and PV load, while also benefiting from high-fidelity simulation that provides greater flexibility and safety than typical analog benches and dynamometers. 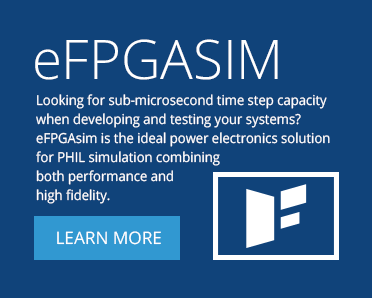 Discover in this webinar how Power Hardware-in-the-loop (PHIL) simulation is revolutionizing the HIL industry, taking testing and validation of power system and power electronics controls, protection and proof of concept to the next level. 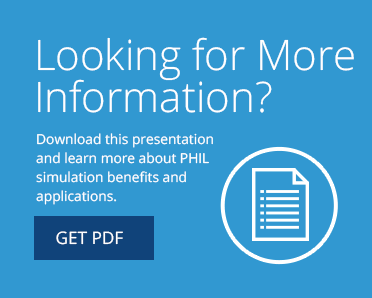 Learn about the benefits and challenges of PHIL simulation, its applications, case studies and much more. High-fidelity real-time power electronics and power system plant models, when combined with a quality amplifier, match the performance of a dynamometer or analog bench, providing greater confidence that the system will perform to expectations. OPAL-RT simulators include standard or custom amplifiers to meet the most stringent requirements in power applications: high accuracy, low distortion, high bandwidth, low phase lag, etc. PHIL enables developers to test a wider range of characteristics than analog benches or dynamometers, with far less maintenance and setup time. This makes it possible to further test hardware robustness over a wider variation of parameters, characteristics and faults. 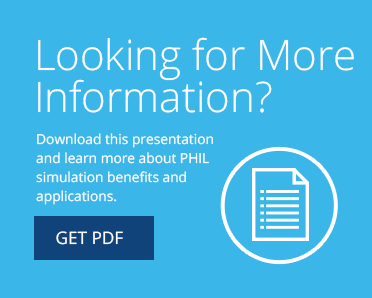 PHIL simulation enables engineers to execute otherwise impractical or risky tests. 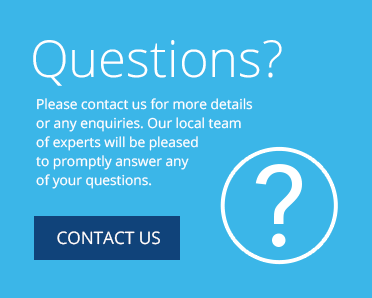 The process also enables inverter thermal testing without actual motors or complex systems. Simply put, PHIL testing enhances operation safety and helps develop safer products and systems. For more than forty years, AMETEK has supplied precision programmable power products and systems to diverse industries for test and measurement needs. Leading manufacturer of analog linear transistor amplifiers, AC/DC current and voltage power supplies for industrial measurement and testing systems. Inductive components for electronics, telecommunications and automotive industries. A leader in electronic equipment design, energy conversion and power electronic instrumentation. Triphase amplifiers provide a means to integrate high-power equipment with OPAL-RT real-time simulators in a closed loop. Chroma provides programmable and regenerative power test instruments and systems for a wide range of applications worldwide.